Navigation & Control Software is at the heart of any AGV installation. Over the decades that AGVs have been available in some form, navigation systems have evolved. For Industrial applications, the type of navigation system used depends on the requirements of The Customer and the environment within which the AGV is to operate. In order to progress, an Automated Guided Vehicle must be able to determine its location and orientation in relationship to the surrounding environment. It also requires information to determine course and speed in order to move along the designated route. 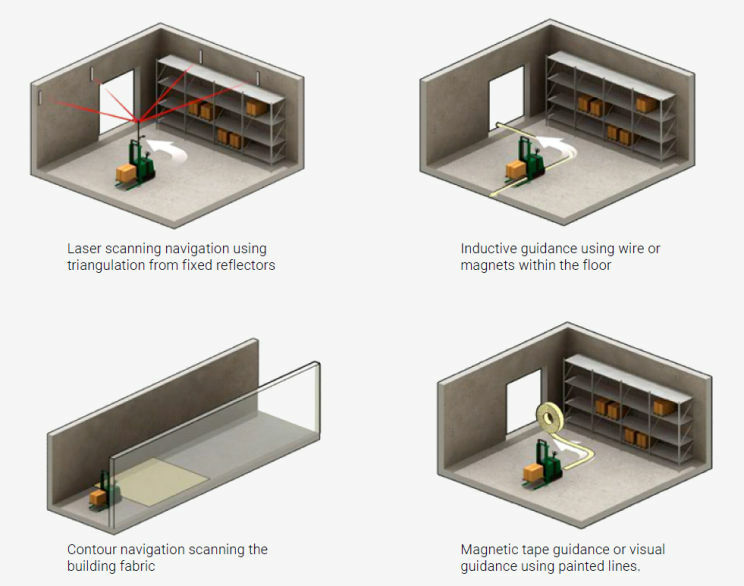 Navigation systems may use physical objects buried within the floor, or affixed to the floor surface. Alternatively the vehicle position may be determined using invisible laser scanning reflecting from either fixed position reflectors (triangulation) or the building fabric itself (contour navigation). Physical objects include magnets, wires, tapes or even just painted lines. Navigation systems based on these technologies also, in many cases, incorporate the routing information into the physical installation, so that the AGV, for example, directly follows the line of the tape. Navigation systems relying on scanning technologies transmit the vehicle position back to the Traffic Control software and this software organises and manages the movement of all the vehicles in the system along their designated routes. The following illustrates several methods of AGV navigation, all of which are available on Quirepace systems.